I first read about Oliver’s Labels while blog-hopping and I thought, this is something I need to try! Not only is the name of the company enough to receive my undying admiration, they are super cute too. The idea is awesome: super strong personalized labels that even stay on after being run thru the dishwasher or put in the freezer! I contacted the folks at Oliver’s Labels and was super stoked when I got an email back saying they would send me a few of their new Date Labels to review. The Date Labels come with a nifty pencil to write the date (and contents if you plan on freezing homemade baby food or breast milk, for example). When Ollie was still using bottles we had to use masking tape to put his name and the date on every bottle, every night. I wish I’d had these labels back then! They are perfect for sending sippy cups or snack containers to day care, or taking along to birthday parties when there would be a million other kids around that have the exact same Gerber sippy cups. I chose the Transportation theme, and put his first and last name on there. They are totally customizable, so if I’d wanted to put “Ollie Stinko Supreme” on there I could have. Their other products look super awesome too… mini labels for smaller things like taking a toothbrush to a friend’s house for a sleep over, iron-on clothing labels, and labels that are designed to stick to the insoles of tiny shoes! Even better: most of their products have what they call a “Found-It code” so if someone finds something with one of these labels on it they can go to oliverslabels.com and enter the code… you get hooked back up with your stuff without giving out your address! I put Ollie’s labels on his sippy cups, and have run them thru the dishwasher at least three times now and they’re still going strong. 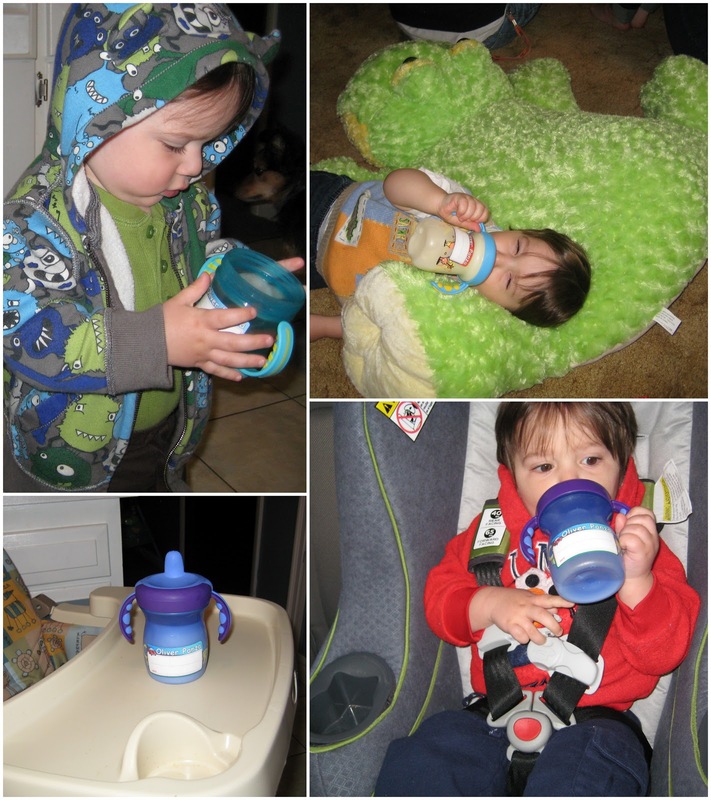 When we’re getting ready to go in the morning, packing the diaper bag and mama’s lunch, I always pick a cup with a label on it for his morning drink while he chills in his high chair. He hasn’t been able to peel these off, and not for lack of trying, which is more than I can say for the masking tape! P.S. If you're inclined to shop and maybe order some Oliver's Labels for your own self, please go to www.oliverslabels.com/sarapanza and I'll get a little kickback. P.P.S. Yes, I liked these so much I signed up to be an agent and tell everyone I know about how they're great and give you a better chance of getting your kid's stuff back home. I received the product mentioned above for free by first contacting Oliver's Labels, then ultimately through using Tomoson.com. Regardless, I only recommend products or services I use personally and believe will be good for people like me. Here's a new video, released today! See you on September 20th, you goofy bastards! So cute. I can't even. When did he turn into a little KID that SITS LIKE THAT? !